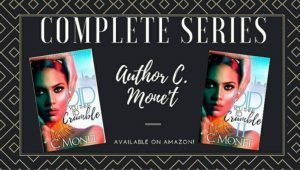 Blaque: Well, we have come to the end of the month, and today with me to wrap up the month of March, I have the pleasure of speaking with author C. Monet Snow. Welcome C. Monet. C. Monet: Thank you Blaque Diamond for this opportunity to share my creations with the world. Blaque: That’s my purpose. To share amazing books with the world. There are so many authors just waiting to be discovered. C. Monet: That is so true. Myself included. Blaque: Yes, myself as well. It is hard trying to find your audience, but they will find you when it’s the right time. Blaque: Let’s get this interview started, shall we? C. Monet: Sure! Go ahead. I’m ready when you are. C. Monet: The feeling of accomplishment inspires me to write. I just turned thirty about a month ago, and I felt like I had done nothing but raise my kids, get married twice, and work for someone else. It was time for a change. Blaque: I understand that completely. Becoming a published author is a great accomplishment. Whether traditionally published, or self-published, it is such an honor all the same. So, do you prefer writing your first drafts on paper, or on　the computer? Why? C. Monet: When I wrote the beginning of my first novel, I had no choice but to use pen and paper. But now I prefer to create an outline, print it out, and doodle, or revisit the document if needed. Blaque: Have you ever used people you know as characters in your books? C. Monet: Yes, I have used several people I know in my stories. No one is safe. Ha! 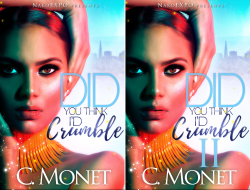 C. Monet: As of January 17, 2018, I have published two books. Blaque: People who support our dreams mean the world to us. Who has been your biggest supporter in your writing career? C. Monet: My husband is my biggest supporter. He changes his Facebook photos, he reads over my shoulder, and he constantly reminds me why I’m doing this. I appreciate that so much. Blaque: Nice! How does it make you feel when a reader tells you that they enjoyed reading your book? C. Monet: When a reader tells me they enjoyed my book, I feel accomplished and grateful. My books detail things I went through in real life. So, to help someone else overcome or confront those hard times, lets me know that nothing I went through was in vain. Blaque: It’s nice when your readers can relate to your books because they have been through, or are going through some of the same things you have in their own personal lives. It makes the reader feel as though they know you, and it helps them to connect with you on a deeper level. Where do you get most of your story ideas? C. Monet: I get most of my story ideas from my own life and music. I love music! I believe it is the cure to all things. C. Monet: This is funny and possibly creepy, but I people watch when I have writers block. People are so funny. Sometimes we display certain emotions in situations that we don’t even realize. I watch characteristics and mannerisms as well. Blaque: I don’t find that creepy at all. People and the things they do make interesting stories. As authors and storytellers, we all have a goal in mind when crafting our masterpieces. What is your goal as an author? C. Monet: My goal is an author is to have limitless creativity, and to be OK with sticking true to me and what gift I possess. My goal is to remain aggressively humble. C. Monet: I am currently working on my third book, “Serene Chaos.” It will be a two-part series that details the chaotic life of Serene Daniels. C. Monet: If I could give an aspiring author any tips, I would tell them to be confident and understand the why. It’s so important to have a reminder and clear understanding as to why you are doing this. Blaque: Great advice! Always know your purpose for whatever you are doing. Now, let’s get to the fun stuff. We already know about you as an author, but let’s see you as a person. C. Monet: My favorite season would have to be spring. I love the newness and the idea of coming back to life. Blaque: Well, how coincidental that I’m interviewing you during your favorite season of the year? LOL. C. Monet: Yes, what a coincidence. LOL. C. Monet: As a child, I was the only girl, spoiled, and the middle child. I was the helper. I learned to cook at an early age and at eleven, I became a big sister. My baby brother is my entire heart, honestly. Blaque: Awwww! Such a loving big sister. What is your zodiac sign? C. Monet: I am a Sagittarius, and I am true to most of what they say about my sign. I’m hot or cold, I’m up or down, I’m right or left, and I can be extremely nonchalant. I also hate routine or anything that places me in a box. C. Monet: I am a lover of 80’s R&B. That is what my playlist mainly consists of. Blaque: I have spoken with so many people from many different areas since I started author spotlighting, so where are you from? C. Monet: I hail from a small town in Tennessee. I’ve lived in Clarksville all my life, and it’s in all of my books. We have a lot of talent here, and it seems as if we are on the rise. Blaque: I am a huge movie buff! I love movies, especially movies with black actors and comedians. What is your all-time favorite movie? C. Monet: My all-time favorite movie is “Cooley High.” I have loved that movie for as long as I can remember. When Cocheese dies I literally scream in horror, like I haven’t seen it before. Blaque: If your best friend could describe you in one word, what would it be? C. Monet: If my best friend could describe me in one word, she would describe me as old. I’m older than her, and I’ve always been the calmer one. C. Monet: Three years ago, I became a ROLL TIDE by marriage, and I now love the sport and know enough about the game to yell ROLL TIDE on my own. Blaque: LOL. That’s funny. What did you want to be when you grew up? Is that the occupation you’re in now? C. Monet: When I was growing up, I wanted to be a teacher and then it moved to being a psychologist as I got older and elected to take a high school course. I was fascinated with the field after that, and I still am somewhat, but it is not what I’m doing right now. Blaque: Are you a cat person, or are you a dog person? C. Monet: I’m a neither person, but I do have a husband that owns 2 black cats, Ace and Onyx. They aren’t as bad as people make them seem. They’re sweet baby kitties. C. Monet: I would describe my personality as positive patty. I’m a lover of people. It drives my husband crazy that I meet strangers all the time that turn into friends. Blaque: I love people also, but I can’t say that they turn into friends. LOL. What is your fondest childhood memory? C. Monet: My fondest childhood memory would be going to Disney World with my step dad. I was sick the whole drive to Florida, but the moment I started to see the castles and buildings, I instantly felt better. We got so many souvenirs that day. Blaque: Let’s end this interview with this last question. We all have things that annoy the heck out of us, or just plain get on our nerves. What is your biggest pet peeve? C. Monet: Ok. So, my biggest pet peeve is having to repeat myself. That severely agitates my entire soul. My mom would always say “If you can huh, you can hear”, and it’s true. It drives me crazy for someone to ask me the same question just in a different way. Blaque: I can definitely understand that. LOL. C. Monet, it has been a great pleasure speaking with you today. C. Monet: It was great speaking with you also. Blaque: Well, we can’t end things without you giving readers a chance to check out your work. Leave them with your information so that they can purchase your books. Don’t forget to mention your social media links as well. It’s great when readers can get first-hand information from their favorite authors by following their social media activity. C. Monet: Of course, I welcome all new readers and followers. Your support means the world to me. 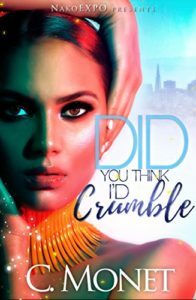 First, both of my books in the completed two-part series Did you think I’d Crumble can be purchased on Amazon. If you enjoy the books, please don’t forget to leave a review. I really appreciate the feedback. Readers can follow my Facebook fan page here. Feel free to follow my Amazon author page to be alerted when I release a new book by clicking here! Visit my website to learn more about me and my books by visiting this link. For those of you who would like to receive exclusive content, don’t forget to join my Facebook group here. There are lots of goodies for you to discover! Blaque: This concludes another awesome author spotlight! Until next time. Happy writing! If you are an indie author, and you would like an opportunity to spotlight on my blog, visit Author Spotlight and follow the instructions to submit your interview. I look forward to speaking with you soon!